Researchers recently made two unanticipated findings when making observations from NASA’s Chandra X-ray Observatory. They clocked the fastest wind ever seen blowing off a disk around the stellar-mass black hole IGR J17091, twenty million miles per hour, and found that the wind may be carrying away more material than the black hole is capturing. Astronomers using NASA’s Chandra X-ray Observatory have clocked the fastest wind yet discovered blowing off a disk around a stellar-mass black hole. This result has important implications for understanding how this type of black hole behaves. The record-breaking wind is moving about 20 million mph, or about 3 percent of the speed of light. This is nearly 10 times faster than had ever been seen from a stellar-mass black hole. Stellar-mass black holes are born when extremely massive stars collapse. They typically weigh between five and 10 times the mass of the sun. The stellar-mass black hole powering this super wind is known as IGR J17091-3624, or IGR J17091 for short. The wind speed in IGR J17091 matches some of the fastest winds generated by supermassive black holes, objects millions or billions of times more massive. Another unanticipated finding is that the wind, which comes from a disk of gas surrounding the black hole, may be carrying away more material than the black hole is capturing. “Contrary to the popular perception of black holes pulling in all of the material that gets close, we estimate up to 95 percent of the matter in the disk around IGR J17091 is expelled by the wind,” King said. Unlike winds from hurricanes on Earth, the wind from IGR J17091 is blowing in many different directions. This pattern also distinguishes it from a jet, where material flows in highly focused beams perpendicular to the disk, often at nearly the speed of light. Simultaneous observations made with the National Radio Astronomy Observatory’s Expanded Very Large Array showed a radio jet from the black hole was not present when the ultra-fast wind was seen, although a radio jet is seen at other times. This agrees with observations of other stellar-mass black holes, providing further evidence the production of winds can stifle jets. The high speed for the wind was estimated from a spectrum made by Chandra in 2011. Ions emit and absorb distinct features in spectra, which allow scientists to monitor them and their behavior. A Chandra spectrum of iron ions made two months earlier showed no evidence of the high-speed wind, meaning the wind likely turns on and off over time. 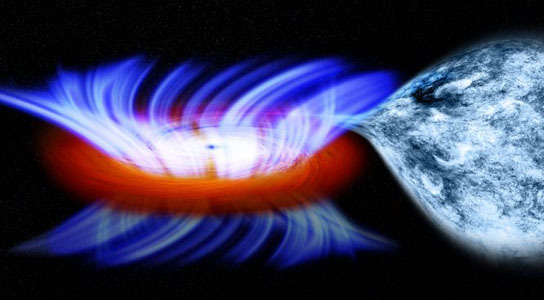 Astronomers believe that magnetic fields in the disks of black holes are responsible for producing both winds and jets. The geometry of the magnetic fields and rate at which material falls towards the black hole must influence whether jets or winds are produced. IGR J17091 is a binary system in which a sun-like star orbits the black hole. It is found in the bulge of the Milky Way galaxy, about 28,000 light years away from Earth. Be the first to comment on "NASA’s Chandra Finds 20 Million MPH Wind"